Anna's Hummingbirds. Photo by Edgar Paul Coral, via Birdshare. Why do I see fewer hummingbirds in midsummer? 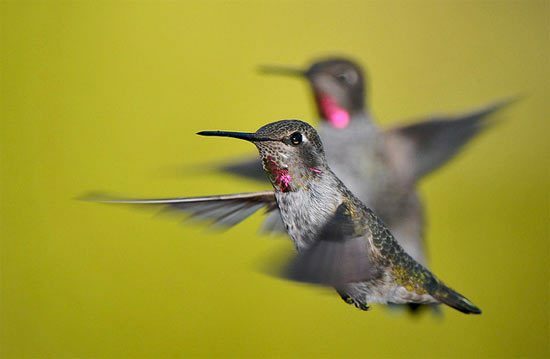 As spring arrives, hummingbirds return to North America (in the Southwest or West Coast, species such as Anna’s Hummingbirds occur year-round). You’ll at first notice one, and then several to many hummingbirds suddenly buzzing around your yard. But adult male hummingbirds are fiercely territorial and may drive all other male hummingbirds away during the spring nesting season. (Where you put your feeders can partially alleviate this—more about that below) By early July or so, after chicks fledge you may see more birds again. These numbers may grow and then decline as migration begins in late summer and early fall. The first wave to depart is mainly made up of male hummingbirds, followed by the females and young. In addition to the “local” birds, migrants from farther north may stop for a rest and a sugar-water pick-me-up as they are passing through. By the way, keeping your feeders up in the fall will NOT cause hummers to delay migration. Many factors trigger birds to migrate, but the strongest one is day length. As days grow shorter in late summer, hummingbirds get restless and start to head south, regardless of whether there are feeders around. Several hummingbird accounts in Birds of North America Online also note that feeders may help hummingbirds survive in early spring or late fall when flowers are not in bloom. If you notice fewer hummingbirds over a widespread area for multiple years, that’s possibly more serious. 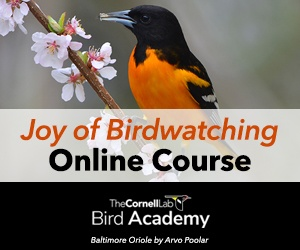 One way to double-check whether others are noticing the same thing is to explore the data at eBird, the online checklist sponsored by the Cornell Lab and Audubon. Check data for your county for the past few years to see if there seems to have been a change in the numbers of hummingbirds reported. Bird clubs and your state’s breeding bird atlas may also have helpful information on population trends. Still, it’s often normal for hummingbird populations to differ from one year to the next. Perhaps availability of natural sources of food or nest sites have changed, causing the birds to look elsewhere. Despite their tiny size, hummingbirds can be injured or killed by free-roaming domestic cats. Some studies have also found that a good wildflower crop will reduce the number of hummingbird visits to feeders. (For an example, see this 1991 research paper in the journal Condor.) It is also possible that there’s more for the hummers to choose from if neighbors have put up feeders in their yards too. So, what you see or don’t see at your own feeders does not necessarily reflect what is happening to a species as a whole—none of the North American species of hummingbirds is in any trouble at the population level right now. Most species are found in the west and extreme southwest of the United States (read our post about shorter-term problems this fall for southern Arizona hummingbirds and what you can do to help). The ideal sugar-water mixture for hot or dry weather is one-quarter cup of sugar per cup of water. Honey contains different sugars than are found in nectar and spoils faster than sugar water, so don’t use it in hummingbird feeders. Red food coloring is unnecessary and possibly harmful. Real nectar is colorless. Change sugar water every 3–5 days to prevent mold and deadly fermentation, and more frequently when it’s over 90 degrees outside. Clean feeders at least once a week with hot water and a bottle brush. Don’t use soap or a detergent. Because mold readily grows in sugar water and can attach to feeders, make sure to take the feeder apart when cleaning. Use a dishwasher on a hot setting or hand wash either with soap and boiling water or with a dilute bleach solution (rinse thoroughly and allow to dry before refilling). If you have a bee, wasp, or ant problem, try moving the feeder. Don’t put oil or other sticky substances around feeding ports to deter insects; you might contaminate the nectar or soil the birds’ feathers. Several smaller feeders spread around your yard may serve more hummingbirds than one large feeder. Male hummers tend to be aggressive, and one bird may keep others away from a feeder even if there’s plenty to go around. What to feed hummingbirds and how to choose a hummingbird feeder. Learn about how to make hummingbird food, keep ants out of the nectar, and more in our FAQ section. Print out our BirdNote on Attracting Hummingbirds (PDF).